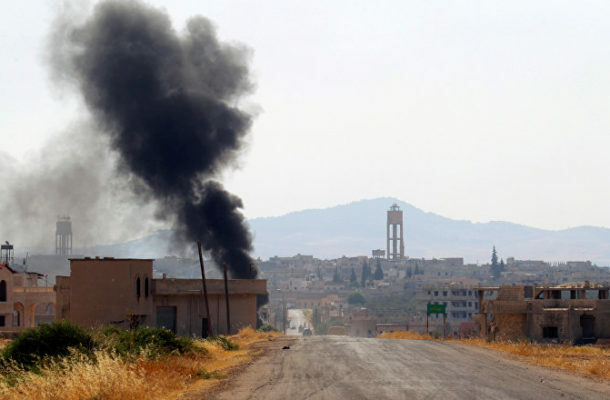 Explosions were heard in the countryside near Syria's city of Hama, Reuters reported, citing local media. Syria's air defences have intercepted missiles in Masyaf, near the city of Hama, Syria's state television said, cited by Reuters. Local netizens have posted on social media alleged footage of the interception. READ MORE: Outgoing IDF Chief Publicly Admits Arms Supplies to Anti-Assad Forces in Syria Social media and local netizens suggest, citing unconfirmed reports, that alleged Israeli jets have struck a military base near Syria's Masyaf purportedly controlled by the Iran's Islamic Revolution Guards Corps (IRGC). Syrian state-run media outlets have not, however, provided any further details on the incident. According to the Syrian state-run news agency SANA, Syrian Arab Army’s units responded on Friday to terrorist organizations’ breaches of the de-escalation zone agreement by targeting their positions with intensive strikes in Hama northern countryside.